Repair Café Toronto is a grassroots, volunteer group that organizes events where neighbours help neighbours learn how to repair. Our events are hosted by local community centres, branches of the Toronto Public Library and other community-based organizations. The video below was filmed at a recent Repair Café event. You can meet some of the volunteers and fixers, and see what it’s like to visit a Repair Café. Where did Repair Café start? The first Repair Café started in Amsterdam in 2009. This initiative has now spread globally and there are more than 1,400 repair cafés worldwide. To learn more, please visit RepairCafé.org. Here is a New York Times article (May 9, 2012) on the Repair Café movement. How did it get started in Toronto? Repair Café Toronto was founded by a small group of citizens in Toronto who support the repair movement started by Repair Café Foundation in Amsterdam. Repair Café Toronto organizes monthly gatherings in which volunteer “fixers” help visitors learn how to repair for free. Repair Café Toronto aims to build a more sustainable society and counter the throwaway mindset. Repair Café Toronto supports the model of the sharing economy through building a community where people with repair skills are valued and organizations collaborate and innovate for the common good. Repair Café Toronto launched the first repair café in May 2013. The video below was created to mark the first anniversary of Repair Café Toronto. It was produced by Benjamin F. Singer. What are the core values of Repair Café Toronto? (3) work collaboratively and partner with a diverse range of community groups to promote sustainability in a fun and inclusive manner. 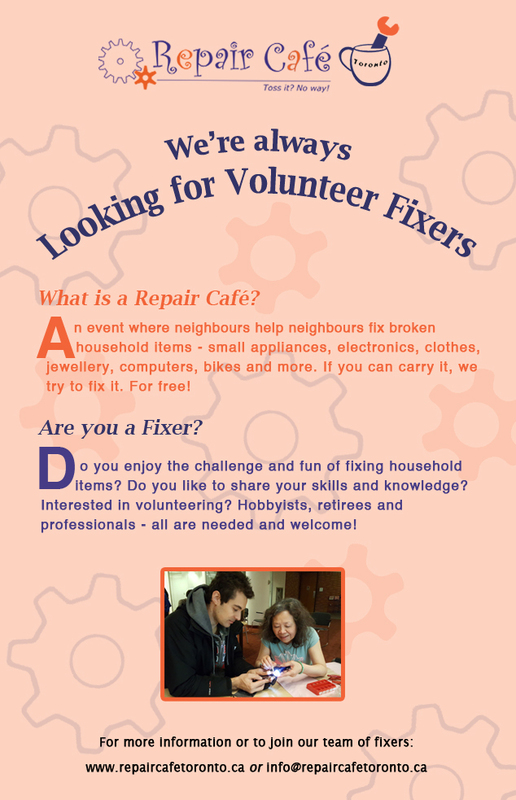 If you are interested in supporting Repair Café Toronto or would like to learn more about the initiative, email us at info@repaircafetoronto.ca, or visit us at our next repair café. We throw away vast amounts of stuff. Even things with almost nothing wrong, and which could get a new lease on life after a simple repair. The trouble is, lots of people have forgotten that they can repair things themselves or they no longer know how. Knowing how to make repairs is a skill quickly lost. Society doesn’t always show much appreciation for the people who still have this practical knowledge, and against their will they are often left standing on the sidelines. Their experience is never used, or hardly ever. Repair Café is changing all that! People who might otherwise be sidelined are getting involved again. Valuable practical knowledge is getting passed on. Things are being used for longer and don’t have to be thrown away. This reduces the volume of raw materials and energy needed to make new products. It cuts CO2 emissions, for example, because manufacturing new products and recycling old ones causes CO2 to be released. Repair Café teaches people to see their possessions in a new light. And, once again, to appreciate their value. Repair Café helps change people’s mindset. This is essential to kindle people’s enthusiasm for a sustainable society. But most of all, Repair Café just wants to show how much fun repairing things can be, and how easy it often is. Why don’t you give it a go?